See the golden pagodas of Wat Phra That Doi Suthep before the crowds arrive, following an early-morning almsgiving to local Buddhist monks. With a private guide at your side, you’ll gain insight into Thai spiritual life in Chiang Mai, including a private blessing ceremony at Wat Umong. After immersion in Buddhist devotional practices, slurp up a lunch of ‘khao soy,’ a northern-style noodle dish. Your 5-hour private tour includes hotel pickup and drop-off. Meet your private guide upon hotel pickup in Chiang Mai in the early morning, and travel by air-conditioned minivan to Mt Suthep where you’ll join local Buddhist devotees in almsgiving. 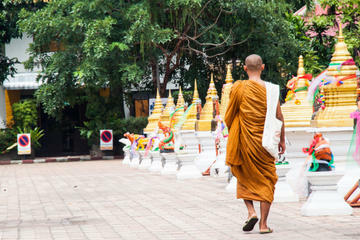 Your guide helps you fill the monks’ alms bowls with rice as they make their daily procession. Re-board the minivan to Wat Phra That Doi Suthep, a Buddhist monastery where you’ll disembark to climb the 309 steps of the Golden Naga staircase. Reaching the top, admire the golden pagodas, a magnificent Emerald Buddha replica and the vista over Chiang Mai. 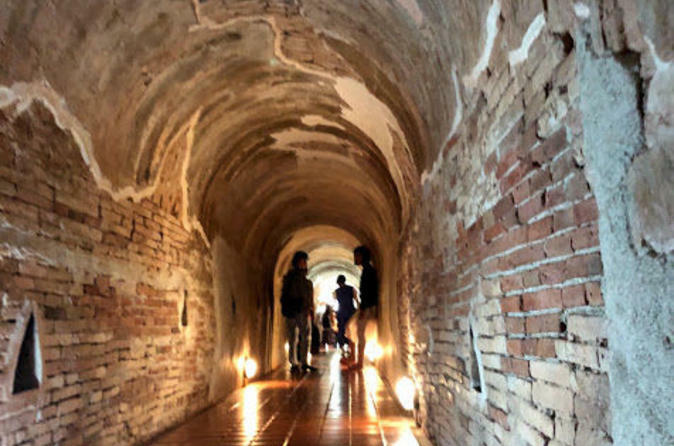 Your next stop includes a walk through mysterious tunnels leading to the 14th-century Wat Umong. During a private blessing ceremony with resident Buddhist monks, soak up the ambient sounds of chanting amid flickering candles and the scent of incense. Finally, sate your appetite with a classic northern Thai dish called khao soy, which is made with coconut milk, crispy noodles and plenty of spices. After this savory breakfast, you’re delivered back to your hotel in Chiang Mai. Our guide Aittippol Keelawong was the best! We received a confirmation call the day before alerting us to inform the hotel to prepare a breakfast box for our early morning departure which we assumed we would have just skipped breakfast. He arrived promptly at the scheduled time with Excellent English Skills.He was very informative explaining not only the alms giving but the history of the Temple. It was nice having him explain the food at lunch. Overall excellent tour made enjoyable by a great tour guide! spent 4 days 3 nights in ChingMai. Day 1 arriving in early afternoon, sign up for a cooking school that night. Joined this morning tour on Day 2, and went for zip line in the afternoon. Went for a performance dinner at night at Mandarin Oriental. Day 3 signed up for a full day tour to Ching Rai black, white and blue temples. Day 4 just wondering in the resort, city, spa and heading to airport. It is an unforgettable experience. I am glad I chose this tour to see Wat Doi Suthep. While there are a lot of tours that will take you to the top of the mountain and the temple, it was really nice to get there early in the morning before the crowds arrived. There were only a few people meandering around when we got there, so it made it easy to get nice pictures and be able to reflect a bit in the quiet surroundings as the guide explained the meaning of the different statues. The giving of alms and the visit to the meditation spot were also nice and the guide was very open and informative and explained many aspects of the Buddhist beliefs and practices. After a quick late breakfast, I was back to my hotel by 10:00 which gave me plenty of time for other activities. Really worth getting up early for. We enjoyed it. The underground Temple at the end of the tour was a bit of a let down. Alms giving and Doi Suthep were incredible. Nice tour. My only complaint is that I was thee only person on my tour and the guide seemed unwilling to adjust his routine to accommodate me. I am a practicing Buddhist and would have liked to have had more time for prayer and reflection. Absolutely Fabulous! Our tour guide Aittipol Keelawong was the best! Very thorough and considerate. This was an amazing tour! Our guide was so knowledgeable and also had lots of experience to share from his times staying at Buddhist monasteries. The lunch of Khao Soy was amazing and delicious. My father and I had a great time on this tour!